Today marks the 12th anniversary of the Sept. 11 terrorist attacks on our nation. Each year, we remember those who died in that tragedy and the thousands of courageous individuals who helped save lives during the disaster and its aftermath. Twelve years later, Osama bin Laden is dead and his network is severely compromised. The Pentagon is rebuilt and work on the new twin tower complex in New York is well underway. Today we remember those who died, including Boston Local 1726 members Marianne MacFarlane and Jesus Sanchez, who were aboard United Flight 175. And, we remember the tens of thousands of transportation industry workers whose lives were affected by the financial firestorm created by the attacks. But just like the people of Boston, Americans find a way to overcome adversity. 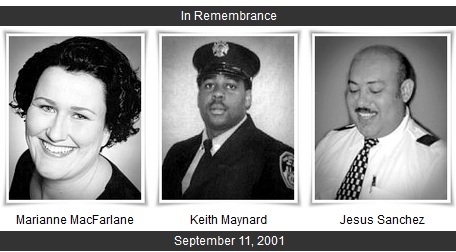 Also killed that day was Keith Maynard, who left his job as a Continental Ramp Serviceman to be a New York City Fireman, but continued to organize for the IAM on his own time. Ten years later, in a merger that had its roots in the realignment of the airline industry caused by 9/11, Maynard’s dream came true and his brothers and sisters on the ramp are now IAM members. His brothers and sisters at customer service followed in 2012. So today, let us pause and remember all those at the Pentagon, in New York and on Flight 93 which crashed in Pennsylvania, and all those who gave so selflessly to help our nation rebuild. International President Robert Roach, Jr.